Just like the combo, Randall's RH50T head is well-designed, well-built and sounds great. Well made. Wide range of 'Plexi'-inspired tones equally well-suited for vintage and modern styles. The two-page manual could be a little more informative. Randall's RG50TC combo impressed us with its neat finish, polished tone and, above all, great value for money. But there are times when one speaker doesn't provide the necessary wallop to get your point across, and for those situations, Randall has thoughtfully released the same design in head format, with a matching 4 x 12. Designed in America and made in China, Randall's valve range is more than a sign of things to come, it's a sign of things already here. Several volume amp manufacturers are already in China and you can bet those that aren't are thinking about it. Having taken this amp and its combo version apart, it's not hard to see why. While the RH50T's construction is obviously made to a price, the standard is easily on a par with what you'd expect to find from similar US- and UK-made competition. Getting the design right and putting a solid quality-control system in place is the key with overseas manufacturing, and Randall has come up with the goods. As with the RG50 combo, you're getting a solid steel chassis with attention to detail where it counts with all the important corners left uncut. This simple design boasts dual-sensitivity inputs, switchable gain on both clean and overdrive channels, and the combo's spring reverb is retained too. Add in an effects loop and you've got all the features you need to get your sound cooking. The cabinet is well-built and neatly covered - this version is loaded with Randall's Jaguar 12-inch drivers - and there's a handy mono-stereo switch on the rear jackplate. The RH50T head delivers the same impressive range of sounds as the combo, but with a lot more power and presence thanks to the extra efficiency of those four 12-inch drivers. 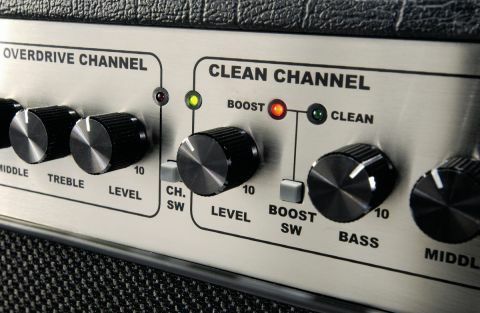 The clean channel's tight, snappy response has the same sweet high end with a great chime effect when pushed hard, while the lead channel's mix of vintage 'Plexi' and modern thrash tones will cover just about anyone's needs - from smooth blues to screaming high-octane distortion, it's all there. There's a lot more low-end punch from the 4 x 12 cab and in a live situation the rig will make you heard with plenty of volume to spare. The included four-button footswitch toggles the reverb, channel and boost functions and setting the amp up is very easy as both channels have wide sweet spots that make the Randall as rewarding to use for practice as it is for live work. The ease with which you can get great sounds cooking is what floored us with the combo, and the head has the same characteristic - whoever your favourite player is, the chances are that within a few minutes you'll be able to achieve something pretty close with a minimum of fiddling.